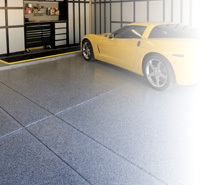 Durable Garage Floors Provided by Slide-Lok in Kalamazoo Area. When you purchase garage floor coatings from Slide-Lok, you get the excellent service that you'd expect from doing business with the leader in the garage interiors market. *Note: Contact us for a custom floor estimate. *Contact us for your Free Estimate, solid color floor; pictured chip floor upgrade available. Can not be combined with any other offer. **Restrictions apply. Contact us for details. Garage Flooring in Kalamazoo, Grand Rapids, cabinets, storage, polyaspartic, monolithic, company, repair, epoxy, 4x stronger, better than, plans, free, shelves, shelving, units, metal, kitchen, services, diy, kits, diy flooring, cheap garage coating, Grand Rapids, garage floors Kalamazoo, garage floor, floor coating, garage flooring, garage floor coating, garage floors, garage solutions, garage floor covering, finish concrete floor, garage floor coverings, garage floor painting, best garage floor, garage floor coatings, overhead, painting, roll, spray, Michigan, doctor, docter, stainless, steel, brushed, no rust, not particle board, plywood, polyurea. Serving the Kalamazoo, Michigan following areas: Portage, Battle Creek, Otsego, Plainwell, Springfield, Hartford, Paw Paw, Bloomingdale, allegan, Wayland, Middleville,Richland, Mattawan, Westwood, Eastwood, Marshall, Three Rivers, Watervliet, Bangor, Augusta, Galesburg, Lawton, Comstock northwest, Charlotte, Tekonsha, Athens, Homer, Litchfield, Albion, Sherwood, Climax, Nashville, Hastings, Woodland, Clarksville, Mulliken, Hopkins, Bloomingdale, Lawrence, Decatur, Marceilus, Cassopolis, Vicksburg, Schoolcraft, Oakwood, Millwood, Knollwood, Arcadia, Sloan, Parchment, Nazareth, Burke Acres, Vine, Edison, Westnedge, Douglas. Sitemap, glossary, resources.